Previously DTW featured what was apparently a transcript of a period road test of the Fiat 132 2.0 by the legendary motoring scribe Archie Vicar; this is a continuation of the road test. This part of the article first appeared in the Skegness Standard. The original photographs were by Dennis du Barry. Due to loss of opacity of the originals, stock photos have been used. If you look even half-heartedly, the revised Fiat 132 strikes one as obviously very much a car for the average driver, despite it all. My decision to visit Nancy as part of a thorough high-mileage road test of the car was justified by the ways the car’s good and not so good points were brought to the fore. These included the very Italian style, both inside and out. In what appears to be a transcript of a period review, legendary motoring scribe Archie Vicar offers some thoughts about the Fiat 132. The article first appeared in the Peterborough Herald and Post, 8 December 1979. The original photograph was by Douglas Land-Wibblemere (sic). Due to poor storage conditions, stock photos have been used. It is a sign, perhaps, of Fiat’s confidence in its engineering nous that the 132 is still on sale, a good seven years after its first appearance at Peterborough Fiat dealers. With the demise of the largely excellent 130, the honour goes to the 132 to take the crown as the flagship of Fiat’s range. To help the 132 undertake this considerable challenge, for the 130 was largely excellent, the 132 has undergone a selection of updates to keep it up to snuff in these increasingly competitive times. Among the welcome alterations to the Fiat 132 are attractive new plastic bumpers, a revised dashboard and improved seat trims (Austin, take note). The steering ratio has been adjusted and lent the support of servo-assistance. These mods are in addition to a re-styled exterior (a few years ago) and thickened rubber mats for models in the upper range. Dud big Fiat or misunderstood mongrel? Lets get our feet wet, shall we? All images taken from original Fiat sales material. The spread we are looking at today dates from November 1977. In line with standard advertising practice it preys on the worries of consumers to make its case. Here is the text, neatly indicative of several prejudices of the day. 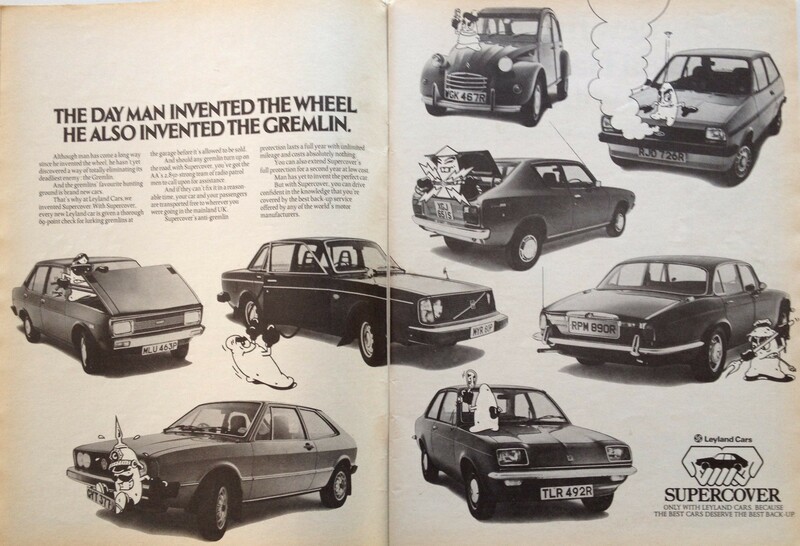 “Although man has come a long way since he invented the wheel, he hasn’t yet discovered a way of totally eliminating its deadliest enemy: the Gremlin.